“An embarrassment of riches” is the phrase that came to mind when I was trying to choose images for this month’s Bloom Day post. 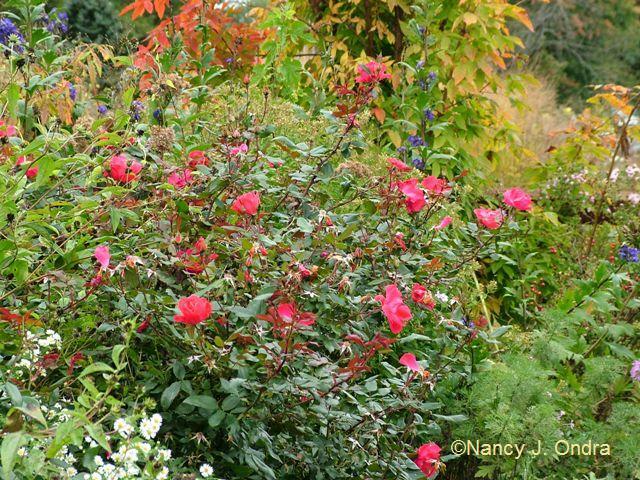 There were just too many for only one post, and anyway, it’ll soon be time for the Hayefield contribution to The Fall Color Project at The Home Garden. And then, I’m thinking, it’ll be time for a celebration of seedheads. But for now, it’s time to focus on the flowers. At the top (I hope I have this ID right) is a frost aster (Symphyotrichum pilosum var. pilosum) that seeded into the garden from the meadow. I’m pretty sure that the white below is also frost aster, inserting itself between a purple New England aster (S. novae-angliae) seedling, pink polka-dot plant (Hypoestes ‘Pink Splash Select’), bright red ‘China Town’ celosia, and a reverted shoot of Hibiscus acetosella ‘Haight Ashbury’. 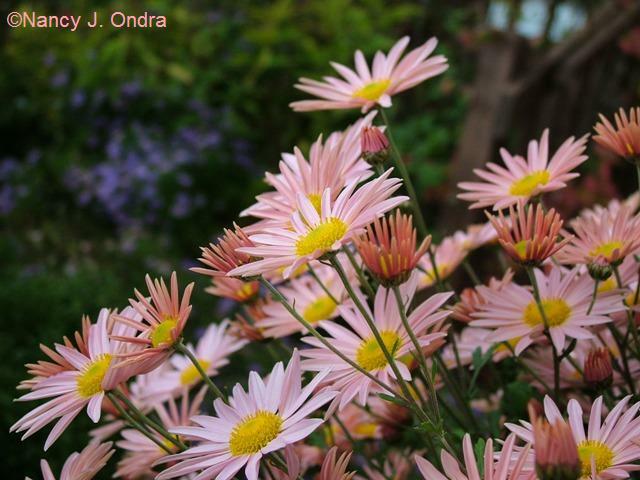 Aromatic aster (S. oblongifolium) also likes to seed around within the garden. Below it’s with yet another self-sown plant, a seedling of ‘Belsay Gold’ comfrey (Symphytum). 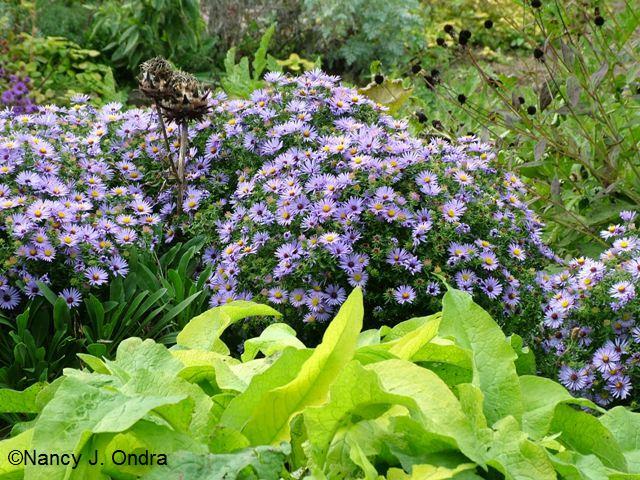 Next, an aster that is still an Aster: ‘Jindai’ Tatarian aster (A. tataricus). 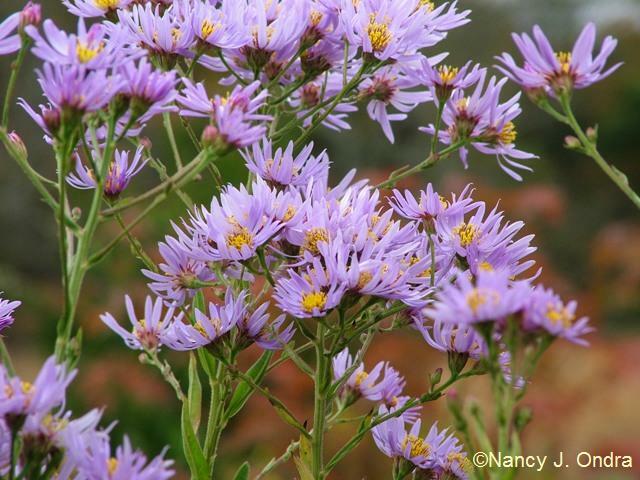 And below, a plant that looks just like an aster, but is in fact a “naked aster”: Gymnaster savatieri. 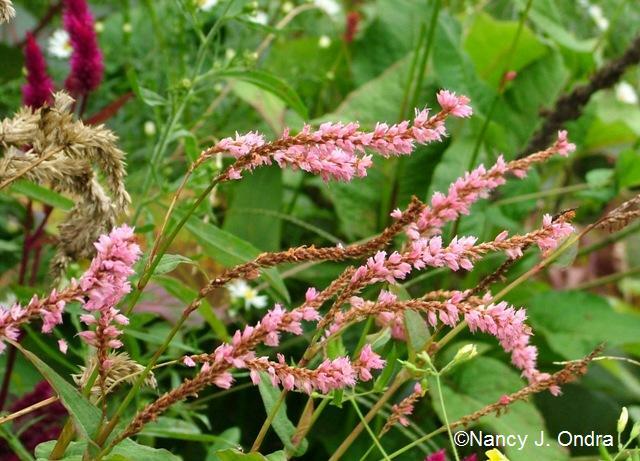 This is also a great time of year for the fleeceflowers (Persicaria). P. amplexicaulis ‘Taurus’ has been a dependable performer here for many years. 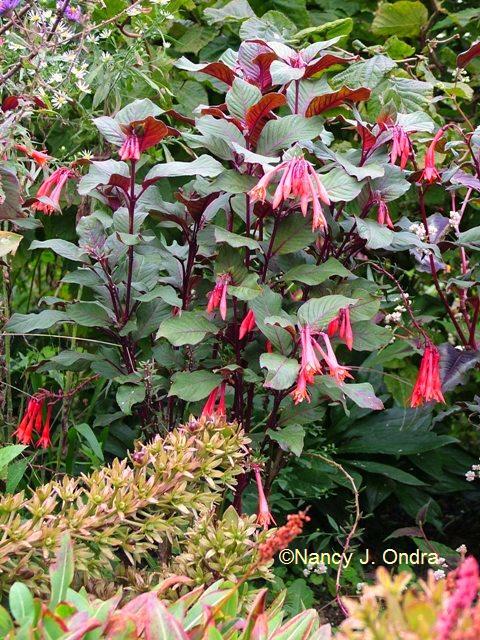 ‘Pink Elephant’ is a much more recent addition, with lighter pink flowers on shorter stems. 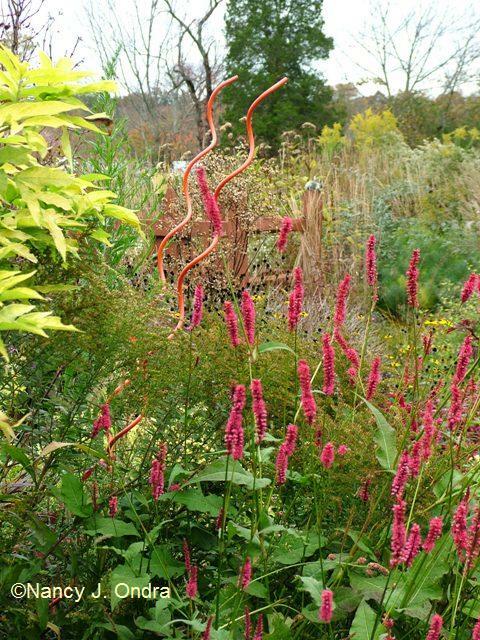 …as is ‘Mystic Spires’ salvia, mingling here with the celosia I call ‘Mega Punk’. 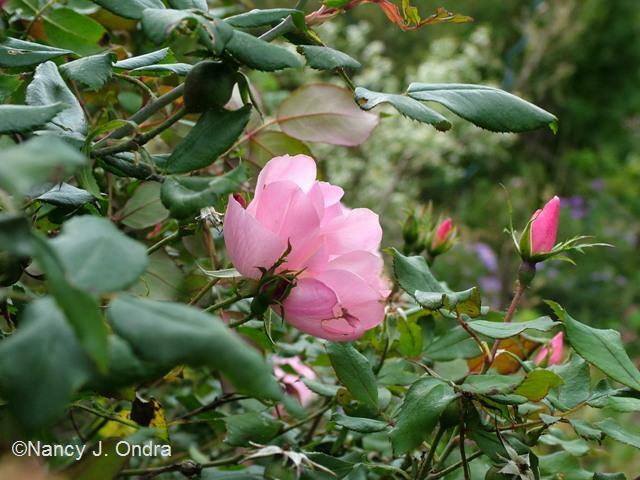 Now, be sure to visit Carol’s Bloom Day post at May Dreams Gardens to find links to mid-October gardens all over the world! I’ve been musing with friends lately what marks out a good garden from the rest and we’re fast coming to the conclusion it’s one which has plenty of interest in September/October. It’s so much easier to have lots of color in fall than in spring – at least in our growing conditions, and with the way I manage the maintenance. As we gardeners are wont to do, I envy gardeners who can do what eludes me: creating a splendid show of early color in a neatly-groomed spring garden. Happy Bloom Day! Your garden is still so full of color, it looks wonderful. 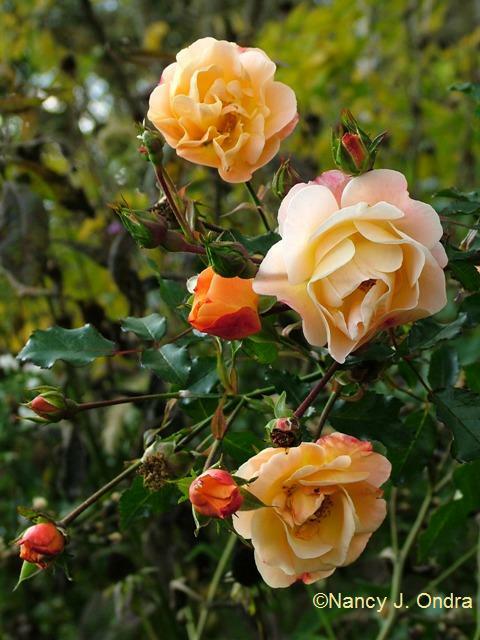 I love the color of your Amber flower carpet rose, the deeper color of the buds really helps to offset the color of the flowers. 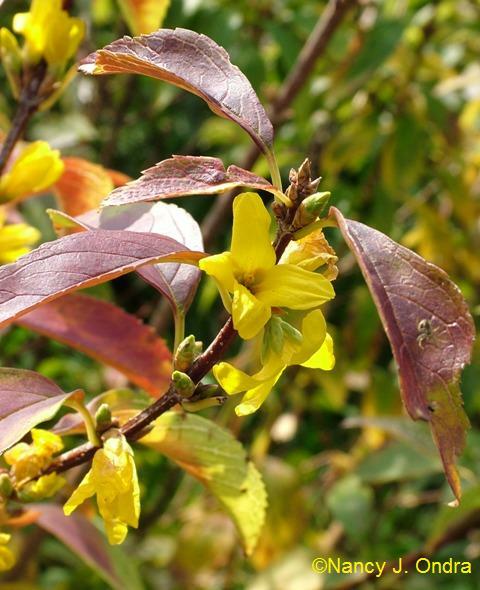 I’m jealous to see how well your Kumson forsythia is performing. I planted one last fall and it did not do well in my garden. I actually moved it last weekend to a more sunny location and I’m hoping for a similar display from mine next year. Hi Debbie! Do give ‘Kumson’ a few years to show off for you. If it was in shade this summer, it may not have set many flower buds. It also seems to be very sprawly for the first few years. But by the spring after next, I bet it’ll be looking good for you. Hi Frances! The lack of Japanese beetles during the last two summers has been a real blessing for the persicarias here. But even in years where they get munched, they seem to always look their best around this time. Once again, I could sit here and make the biggest shopping list just from your bloom day posts, since we are in the same hardiness zone. And this winter, I think I will, reading your wonderful books, too, to come up with a big list of flowers for every month of the year. Thank you for sharing your garden with us on bloom day! Thanks for visiting, Carol, and for coming up with Bloom Day in the first place. It’s inspired me to take pictures all year ’round, and now, I’ve got quite a collection of images from all seasons. I’m thinking that there’s a book idea in there somewhere! Kind of you to visit, Sylvia. Happy Bloom Day! Again a great profusion of blooms and many ideas for my garden. Thank you. Hi Marie! As you can tell, I was lucky to catch these images before the spell of cold and wet weather we’re getting now. 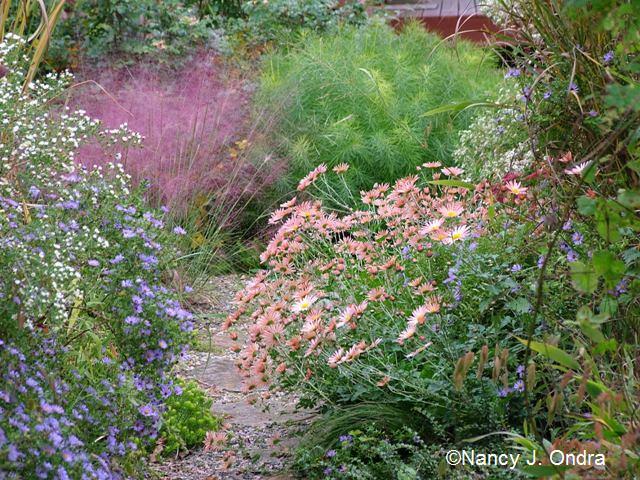 I really like the picture of the Sheffield mums on the right side of the pathway with the muhly grass in back. Very neat stuff! 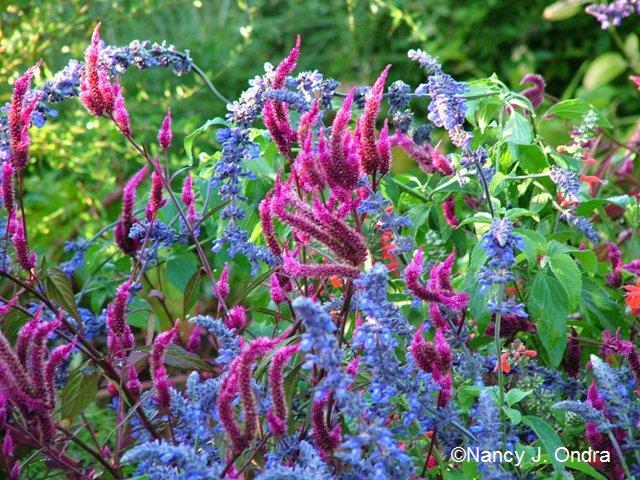 The celosia and salvia mix is very neat too. Did you plant it that way or did the celosia self seed? 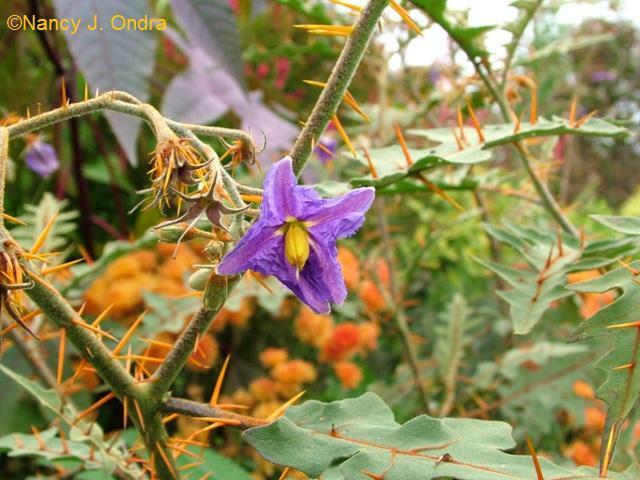 I’m not a fan of the Solanum, it’s pricked me more times than I can count this year! That celosia-and-salvia shot is from work. I saved lots of the celosia seed here last fall and scattered some over there in April. I weeded out some of the excess seedlings, but I find that when they’re a bit crowded, or when they’re in rich soil, they’re more likely to lean or sprawl, which is what leads to the curves in the flower spikes. I hadn’t specifically planned for it to mingle with the salvia, but I enjoyed the effect. Your Salvia-Celosia combination almost makes me want to try celosia again. Thanks, Xan! It sounds like some clever breeders need to turn their attention to producing new celosias. These spiky ones are fun, and it would be neat to have more color options than magenta and soft pink. Oh, my, that was wonderful! Now that’s what October is supposed to be like. 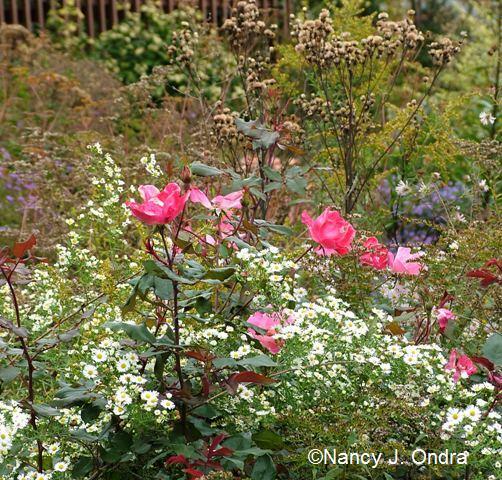 Your Roses are so full and lovely yet, and the Cosmos with the Amsonia is a knockout combo. I think my Mum might also be ‘Sheffield Pink.’ I like the daisy flower form so much better than the button or cushion types. I love the Burnet with the “Aster” oblongifolius as a backdrop. Thanks, MMD! I wish I could take credit for the cosmos/amsonia combo, but it was purely by chance. ‘Sheffield Pink’ is such a good fall performer, and it looks so nice even when it’s not in bloom, that it’ll always have a place here. I also appreciate that it doesn’t need summer pruning to develop a good shape. Gorgeous, Nan. And once again I’m wishing I could grow that amsonia. It looks good with everything. Not to rub it in, Pam, but around here, it looks good with everything because its seedlings are coming up just about everywhere. Not that I’m complaining, mind you: there aren’t tons of them, and I’m happy to have them to fill empty spots. An embarrassment of riches indeed! So many beautiful groupings. I see in one picture you have an amsonia. You know, I ordered and planted three of them this year based on your Fallscaping book. Unfortunately I won’t have any lovely color because I let some kind of butterfly larvae eat them! I was desparate for butterflies, can you tell? Anyway, I’m hoping they weren’t so stressed from that experience that they won’t come back. My fingers are crossed. How disappointing! But if it’s any consolation, it appears that amsonias are host plants for the larvae of a couple of native butterflies and moths, including coral hairstreaks and snowberry clearwings. So, you’re doing your part for your local ecosystem. Of course, that’s cold comfort when you’re deprived of the fantastic fall folor. But the plants are really tough, so I bet yours will return. Thanks, Liz! It’s surprising how much still looks good, even after a light frost. 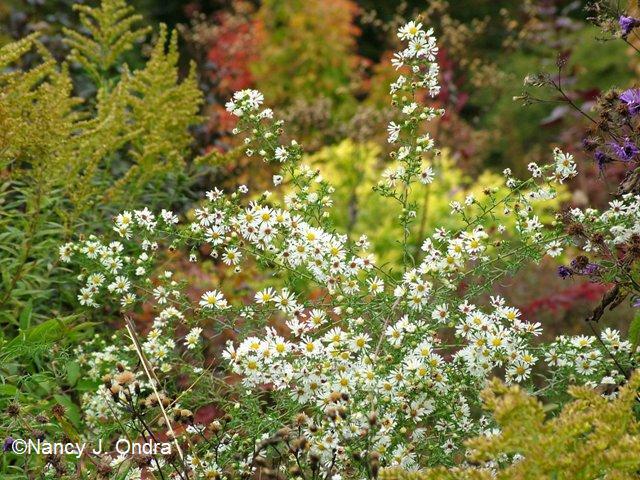 With the asters, it seems that you need to plant only one or two, then let them go to seed, and you’ll have plenty! OMG that combo with the Cosmos bipinnatus looks unreal! Once again you have outdone yourself with your plant colour combo. I NEED you to come down to the Caribbean and do some magic like that in my garden LOL.I agree, the Carpet Amber looks delectable. But Nicole, I can’t claim any credit for the cosmos putting itself in such a perfect place. I just happened to spot the combo in an otherwise rather messy holding area out back. So your chances of making a great pairing like that are as good as mine! Nan, what wonder blooms! I particularly loved that ‘Belsay Gold’ comfrey, stunning! Love all the self-seeding going on. And that ‘Sheffield Pink’ mum is delightfully un-mummish! Glad your Amber carpet rose is blooming amber…mine has been decidedly pink…perhaps it needs cooler weather to show its true colors. Thanks! FC Amber has been a rather washy pink here too for much of the season, but the rich color now was worth waiting for. I hope yours darkens too. Forget the roses — it’s the rest of your garden that’s the “knock-out!” You’ve got some spectacular color combinations, in particular the salvia/celosia and the cosmos backed by the amsonia. Really glad I stopped by and was able to take in all this color and beauty on what’s a cold, rainy day here. Aw, thanks, Linda! With this dreary, Decembery weather, any color is welcome. I’m glad I could help. Such beautiful fall colors. I’ve always want ‘Sheffield Pink’, I’ve got to get one of those. I think the only drawback is that ‘SP’ blooms so late that it’s easy to forget to acquire one earlier in the season. 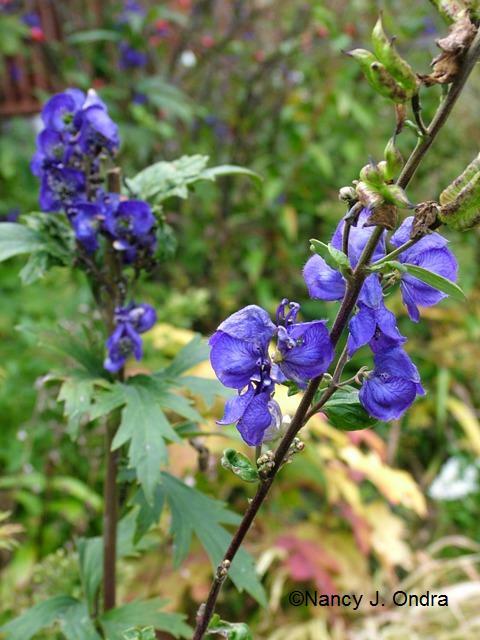 But it makes a great passalong plant, if you happen to know a gardening friend who has it. I appreciate the visit, Gail, and I’m delighted that you found some ideas! Embarassed or not you have some real beauties here Nan. I love the amsonia/cosmos combo too, is there a trick to growing amsonia? The greenhouse I worked at this spring sells it, but it doesn’t look great in the pot, so it’s not a wild seller. Love the ‘Mega Punk’ celosia too, great name! Oh yeah, Amsonia hubrichtii is pretty slow to bulk up, so it tends to look pathetic in a pot, and for a few years after planting too. But it’s soooo worth waiting for. Once customers have seen an established clump, they find the potted starter plants much more tempting. Look at all those lovely blooms! I just looked up pink elephant, as I’d never heard of it, and love it, but found it’s not for my zone. Sorry to tease you, Sue. You could probably get a similar effect with ‘Flamingo Feather’ celosia; its spikes are thicker, but it’s an annual, so you wouldn’t have to worry about hardiness. I agree, your Sheffield pink mum is lovely. You have so many delightful blooms but I think my favorite is the cosmos among the whispery foliage. You have so much color in your garden it is a feast for the eyes. Happy bloom day. Thanks so much for stopping by today. Another vote for the cosmos! Hmmm…would that make it a cosmic combination? I’ll look forward to seeing it. That’s the mark of a true gardener: finding just the right site for a plant, even if it isn’t in your own yard! 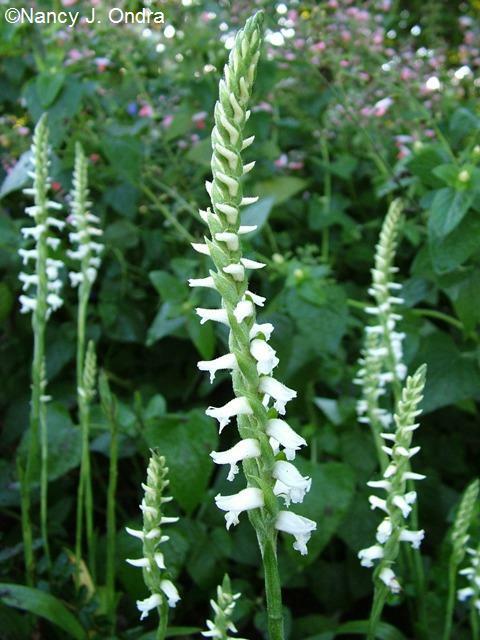 The Lady’s Tresses are SO dainty and the color of the Cosmos is fantastic! Thanks for sharing all of your blooms with us! Isn’t the spiral pattern of the buds on that orchid (the lady’s tresses) just the coolest thing? Happy Bloom Day! 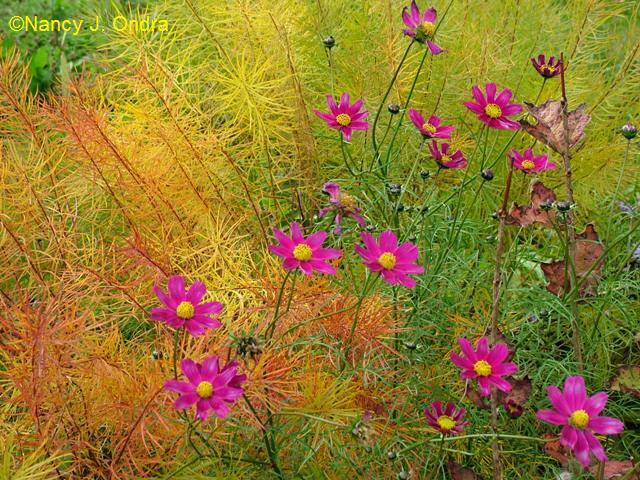 A truly stunning fall garden. I’ve been thinking I might help some Frost aster to seed in my garden next year. It’s one of the special wildflowers that signal Fall here. Your Bloom Day is very inspirational! Thanks! 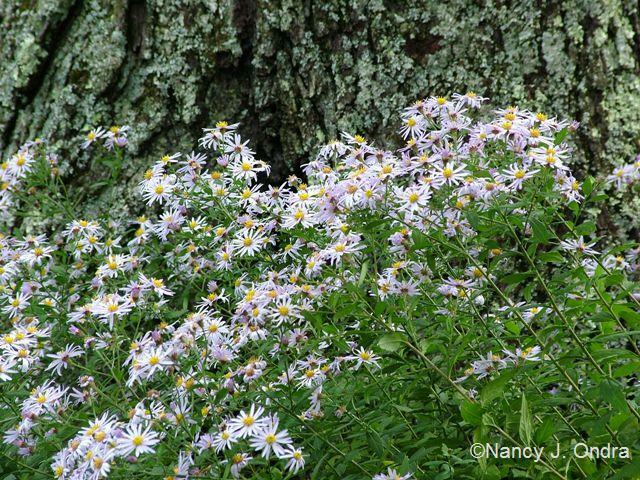 I pull out loads of various LWAs (little white asters) during the summer, because their foliage looks so weedy, and they seem to spread quickly if unchecked. But I always miss a few, and I’m always glad I did when bloom time comes! You have a garden full of colorful fall beauties, Nan. I’d love to add “Sheffield” to my garden. I fell in love with it last year, but haven’t found it yet. Those K Outs and the amber roses are glorious! My lovely whispy Cosmos has been zapped, unfortunately. It’s good to see yours is still surviving. It’s such an easy, carefree flower. Wonderful fall offerings for Bloom Day! 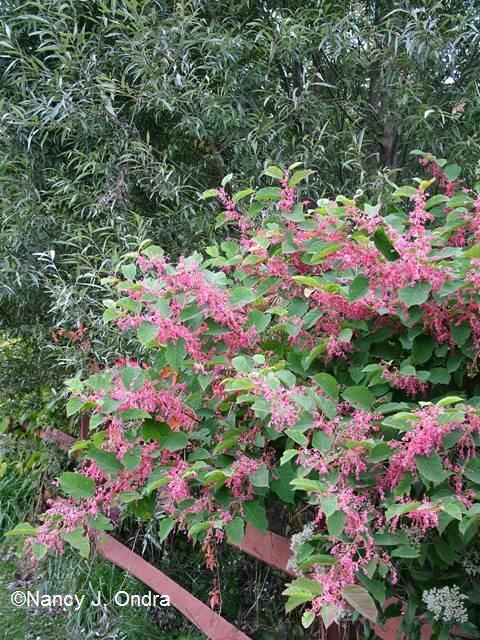 E-mail me in the spring, Kerri, and let’s see if we can get you some ‘Sheffield Pink’ for your garden. It would look so good with your other blooms this time of year! 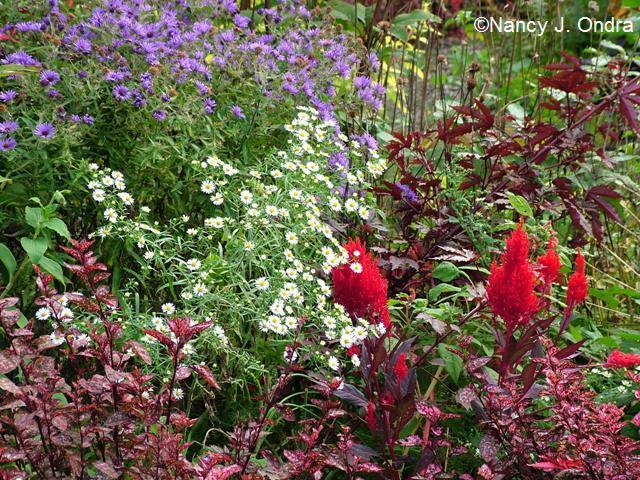 Your garden is inspiring in every season, I love checking in to see what fantastic plants and combinations you are sharing with us. I am never disappointed! I am so curious about the persicarias…I have a small zone 5/6 garden that is pretty jam-packed so I tend to stay away from plants that spread by runners. ‘Taurus’ and ‘Pink Elephant’ are so colorful and fun and I’d love to know your experience with their growth. Thanks for helping keep the web a beautiful place!!! No worries about the P. amplexicaulis cultivars being aggressive, Christine – at least in my experience. I find one or two seedlings a year, maybe, and the clumps themselves have broadened, but they don’t creep outward like some other persicaria species do. I highly recommend them! Lovely October flowers in bloom there Ms. Nancy! We’ve a few things hangin on here, that is up until last night. It was 27 this mornin when I boarded my bus. But it’s warmed up to 50 right now. Thanks for visiting, TC! It’s great to meet another PA blogger. Uh oh. I didn’t know S. oblongifolium was a prolific self seeder. So I shouldn’t have planted 4 of them? 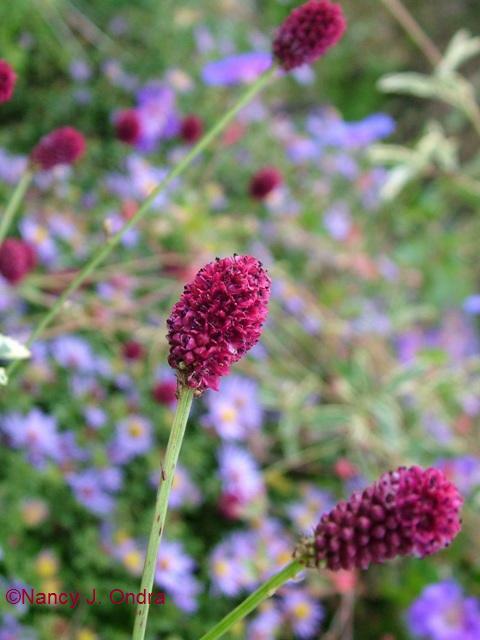 And you have solved a mystery I’ve been lazy about: ‘Dali Marble’ burnet. The plant tag said summer bloom, butthe last two years it’s bloomed in October (last year it froze early and it had barely got going). Now it’s in full bloom, and I figured it was confsed. Nope! I have another cool fall bloomer! Huzzah! Glad to be of service, sir. And don’t worry about the asters; I’m inclined to think that the seedlings are a blessing, not a curse. They’re great for filling spaces that would otherwise be empty.